We studied the callus features seen in cases of regenerate fracture in femoral lengthening using a monolateral fixator in achondroplasia to determine whether callus types and shapes can predict the probability of callus fracture. 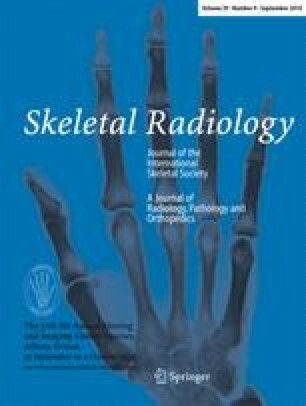 The radiographs of 28 cases of femoral lengthening in 14 patients, 14 cases of callus fracture, and 14 cases without callus fracture were retrospectively analyzed by four observers and classified into different shapes and types in concordance with the Ru Li classification. The average lengthening of 9.4 cm (range 7.5–11.8 cm) was achieved, which was 41% (range 30–55%) of the original length and the average timing of callus fracture was 470 days (range 440–545 days) after surgery in the callus fracture group. While the average lengthening of 9.1 cm (range 8–9.7 cm) was achieved, this was 30% (range 28–32%) of the original length in the group of patients without callus fracture. The callus was atypically shaped, there was a 48% average (range 30–72%) reduction of the callus width compared with the natural width of the femur, and a lucent pathway was present in all cases of regenerate fracture. A lucent pathway was seen in all fracture cases with concave, lateral, and atypical shapes, and there was more than 30% lengthening and 30% reduction of the callus width compared with the natural width of the femur, which are the warning signs for regenerate fractures. These signs help the surgeon to predict the outcome and guide him in planning for any additional interventions. The Ru Li classification is an effective method for the evaluation of the chance of callus fracture. This study was supported by a grant of the Korea Healthcare Technology R&D project, Ministry for Health, Welfare and Family Affairs, Republic of Korea (A080588). Authors thank to Mrs. Prakruti K. Devmurari for her assistance in writing manuscript, preparing the diagramatic illustration and stastical analysis as well for the article.